Now you can prepare Greek yogurt dishes quickly and easily. This unique, BPA-free strainer kit transforms up to 2 quarts of ordinary homemade or store bought yogurt into thick, creamy Greek-style yogurt in a matter of hours - all inside your refrigerator. Enjoy healthy dips and spreads, delicious Tzatziki, salad dressing or delicious sweet berry desserts. Recipe book included. Ingredients: Organic milk, live active cultures. Shelf life: Room temperature: 3-4 months, refrigeration: 9 months unopened. 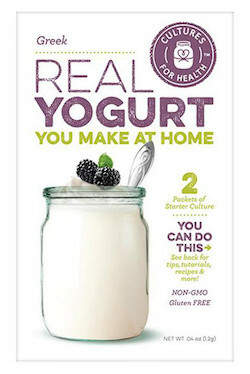 Simple instructions and recipes for using yogurt cheese included. For making Greek-style yogurt or Labneh (yogurt cheese). Can be used with store bought or homemade yogurt.